Quadriceps contusion or a ‘cork thigh’, as it is commonly known, is the result of a severe impact to the thigh which consequently compresses against the hard surface of the femur (thigh bone). This often causes deep rupture to the muscle tissue and haemorrhage occurs, which is followed by inflammation. Such an injury can also occur in other body regions such as the calf or upper arm; however these are less common than in the thigh region. as Australian football and rugby, or sports such as cricket, hockey or lacrosse where a hard ball or object may strike the thigh of a player. Contact sports and sports that require quick starts, i.e. running races and other track events. Warm up and cool down habits. Injury history, especially to the thigh, hip and/or knee. Medical history of any bleeding disorder. Wearing protective padding over the thigh. Participating in a strengthening, flexibility and conditioning program appropriate for the sport being undertaken. Undertaking training prior to competition to ensure readiness to play. Gradually increasing the intensity and duration of training. Allowing adequate recovery time between workouts or training sessions. Checking the sporting environment for hazards. Drinking water before, during and after play. Avoiding activities that cause pain. If pain does occur, discontinuing the activity immediately and commencing RICER. At the time of this type of trauma a player may experience varying levels of pain and reduced range of motion. The extent of pain and loss of movement will be dependent on the amount of force and the impact of the force at the time of trauma. The traumatised area will become swollen and painful to touch. * The return to sport period form all grades of contusion injury may be significantly reduced with good early injury management practices and assessment by a sports medicine professional. muscle. Symptoms include overnight and morning pain, as well as pain on muscle contraction. It may be possible to feel a hard bump or ‘woody’ feel within the muscle. Stiffness and loss of knee range of movement are also common. Poor treatment of a contusion may also lead to the development of Myositis Ossificans. Bone formation associated with Myositis Ossificans usually ceases after six to seven weeks, at which time the formed bone begins to break down and be reabsorbed by the body. Complete recovery can however take up to 12 months in more severe cases. Little can be done to accelerate the reabsorption process of Myositis Ossificans and care should be taken in the treatment of the condition to avoid its long term effects. Assessment by an experienced sports medicine professional may help with pain control and assist the recovery process with supervision of the rehabilitation process. The immediate treatment of any soft tissue injury consists of the RICER protocol – rest, ice, compression, elevation and referral. RICE protocol should be followed for 48–72 hours. The aim is to reduce the bleeding and damage in the muscle. The thigh should be rested in an elevated position with an ice pack applied for 20 minutes every two hours (never apply ice directly to the skin). A compression bandage should be applied to limit swelling and bleeding in the injured area. The No HARM protocol should also be applied – no heat, no alcohol, no running or activity, and no massage. This will ensure decreased swelling and bleeding in the injured area. Gentle, gradual, pain free stretching of the muscle will assist in restoring full range of motion in mild muscle contusion injuries. Moderate to severe contusions may require the use of crutches to ensure complete rest, particularly if full weight bearing on the affected leg is painful. Light stretching should be utilised immediately post injury. This will help reduce muscle spasms and make stretching more beneficial in the days to come. Utilise standard quadricep stretching techniques with the hip flexed and extended. These should be performed with a 10 second hold of the stretch, repeated three to five times daily. Another early rehabilitation technique used is Quad Sets. 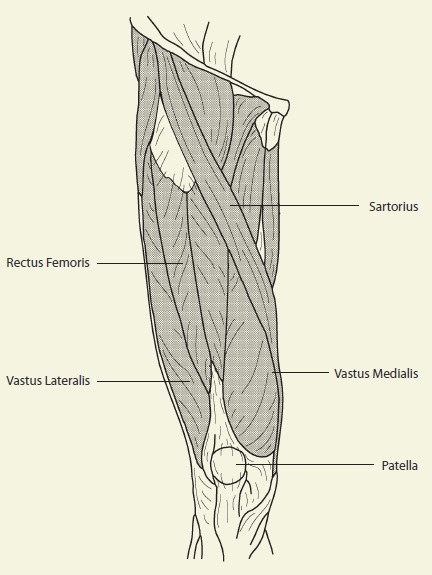 These are isometric contractions of the muscle. The athlete tries to make the muscle flex and holds for 10 seconds, repeating 30–60 times, three to five times daily. Strengthening of the injured muscle should begin two to seven days post-injury, depending upon the severity. Four plane straight leg raises. Sports Medicine Australia wishes to thank the sports medicine practitioners and SMA state branches who provided expert feedback in the development of this fact sheet. The information above is general in nature and is only intended to provide a summary of the subject matter covered. It is not a substitute for medical advice and you should always consult a trained professional practising in the area of sports medicine in relation to any injury. You use or rely on the information above at your own risk and no party involved in the production of this resource accepts any responsibility for the information contained within it or your use of that information.